Wait, do you mean Gramercy Tavern? No, no I don’t. And though they’re both owned by the Union Square Hospitality Group (the brainchild of Danny Meyer [of Shake Shack fame]), Gramercy Terrace is nothing like Gramercy Tavern–except for its supple sophistication. Located on the roof of the Gramercy Park Hotel–whose feel transports you back a few centuries–Gramercy Terrace is a well-lit space (and surprisingly warm in the winter months) where summer cocktails are often consumed. In fact, it’s been rated one of the best rooftop bars in the city–and I get it. It’s gorgeous and quiet, and you feel like you’re afar from the city, yet of it (as demonstrated by the towering buildings that you can view from your seat). My lady dining partner and I visited Gramercy Terrace for restaurant week (which I’ve discussed). Just a few blocks from our office, it presented a nice departure from the hum-drum of the neighborhood lunch offerings. We got all gussied up–MLDP wearing her finest fur, me in a cute black dress–and made our way over there, to find a comfortably serene restaurant awaiting us. 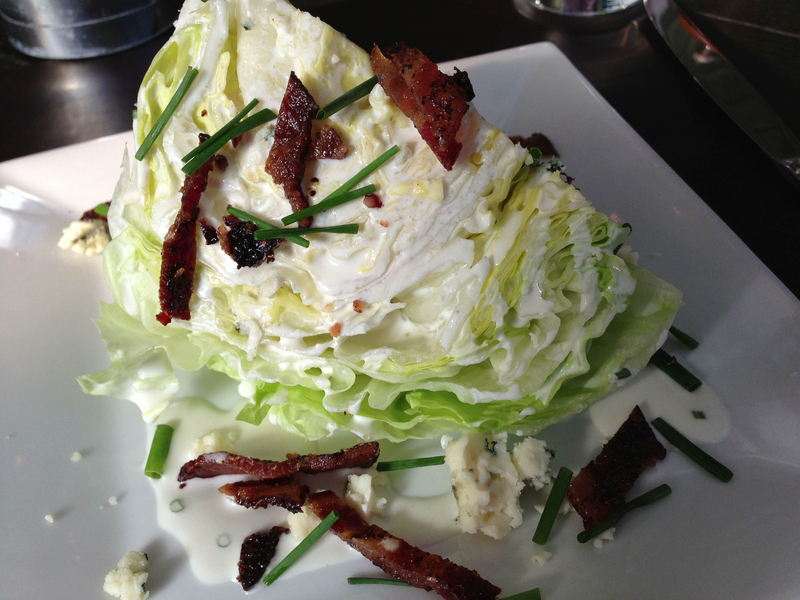 For appetizers, we both ordered the iceberg wedge, drenched in Maytag blue cheese and covered with bacon strips. “I’m not sure how to eat this,” said MLDP, but we both dug in. Before the salad, we were served salt-and-pepper popcorn in a cute tin, which was very good. I thoroughly enjoyed my iceberg wedge, and I believe MLDP would say the same. 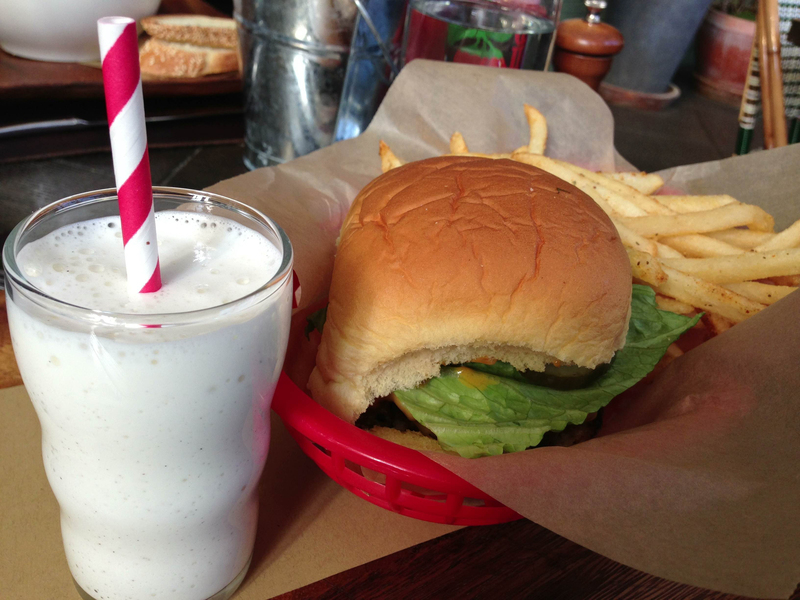 I got the cheeseburger for my lunch entree, which came with spicy fries and a tiny milkshake with a red-and-white straw. The milkshake was just so cute, I had to drink it (even though I initially protested–MLDP was supportive in its eventual consumption). The burger was juicy and the hint of “fancy” sauce eluded my palate–I couldn’t place the flavor–but this was, by no means, my favorite burger. The spicy fries were overly spiced, in my humble opinion, but were fine. MLDP ordered the (gramercy) Waldorf salad, which notably featured slices of celery, but too much of it in MLDP’s opinion. It looked good, but was on the small side, and was accompanied by two slices of sesame-coated French bread–a nice touch. 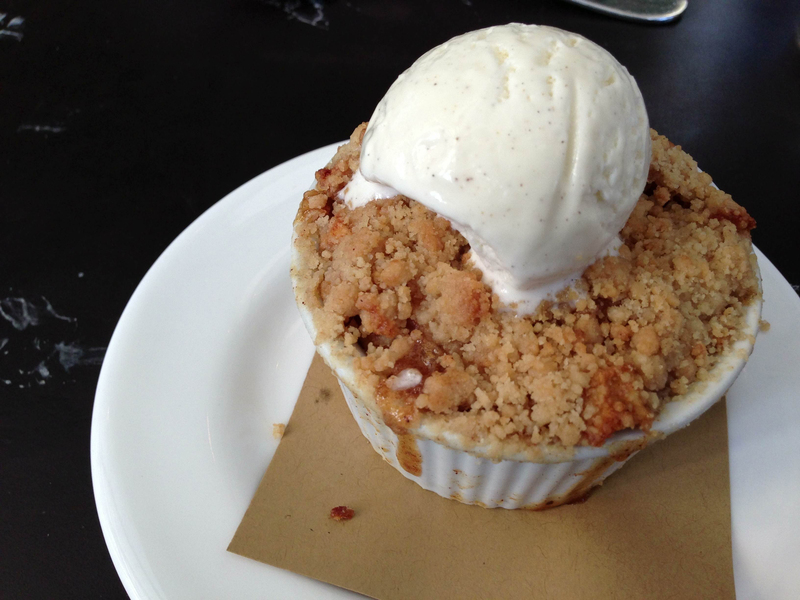 For dessert, I opted for the apple crisp, which had cubed apples within and was topped by delectable vanilla ice cream. MLDP got the brownie sundae–a rich, chewy-enough brownie with vanilla ice cream and candied pretzels. Yum! So good. A waiter (or somebody who worked at Gramercy Terrace) came over to ask how our meal was, and we told him it was excellent. He went on to explain that while Gramercy Terrace strives to serve up comfort food, they do it with a flair of sophistication. I must agree. Everything at Gramercy Terrace–from the tiny milkshake to the waitress’ insistence on addressing us by “ma’am”–added up to a highly sophisticated experience. Though the food is great, Gramercy Terrace is only open for breakfast, brunch and lunch. You’ll have to just go to Gramercy Tavern–have I thoroughly confused you yet?–for your nighttime meal. Take the 6 to 23rd Street and walk south. Gramercy Terrace is located in the Gramercy Park Hotel.